STAMFORD, CONNECTICUT, JUL 12 (ZENIT)- (Fides) - On July 31st, the feast of Saint Ignatius, Cardinal Ignatius Kung (Gong) Pin-mei will not celebrate his name day. At Holy Spirit Church, Stamford, USA, (where he has been exiled since 1987) he will celebrate a thanksgiving Mass in honor of Our Lady of Sheshan (a Marian Shrine on the outskirts of Shanghai). He has much for which he wishes to thank God: 20 years a cardinal, 50 years a bishop, 70 years a priest, 98 years of life. But Cardinal Kung wishes above all to thank Our Lady for her "loving protection... during fifty years of persecution". For the occasion Pope John Paul II, who nominated him a cardinal secretly "in pectore" in 1979, sent a message of greetings to Cardinal Kung, through the Archbishop Edward Egan of Bridgeport. The Pope's message is dated June 16th, while the Cardinal replied on July 6th. Both texts were provided by the Vatican News Agency "Fides." The papal message was an assurance of the Pope's "closeness in prayer" during this moment of thanksgiving. He commended the Cardinal to "the loving intercession of Our Lady of Sheshan" and imparted his Apostolic Blessing. Cardinal Kung's response to the Holy Father pointed out the coincidence of his anniversaries with the 50th anniversary of the persecution of the Roman Catholic Church in China. "The clergy and faithful in China are grateful that Our Lord Jesus Christ has chosen the least of His children as witnesses for the One, Holy, Catholic and Apostolic Church. Through the loving protection of Our Lady of Sheshan, the number of Roman Catholics in China has tripled during this half century of persecution," the Cardinal stated. After assuring the Pope of his unflinching loyalty to the Holy See, Cardinal Kung went on to write, "Your Holiness, I am forever grateful for your fatherly affection. Twenty years ago you raised me to the Sacred College of Cardinals from my Chinese dungeon. You held and nurtured me in your heart with prayers for twelve long years. It is unlikely that the underground bishops or I can travel to the eternal city to see you. However, your face, your teaching and your words of encouragement will always remain vividly in the hearts of your 9 million children in China." As for the Catholics in China, Cardinal Kung concluded that "We dare not pray for a miracle, but for the grace and courage to live the fullness of our faith, imitating the glorious examples of the many martyrs who shared our experience and have gone ahead of us. We pray that there will be 'one flock and One Shepherd' and that we may soon be free to welcome you, our Supreme Pontiff, on China's soil." A Life in Service of the Church Ignatius Kung (Gong) Pin-mei was born in Shanghai on August 2, 1901, into a family of fifth-generation Catholics. He entered the seminary at the age of 19 and was ordained a priest on May 28th 1930. As a diocesan priest he taught for many years in Catholic schools. In 1949, when the Communists took power in Shanghai, Fr. Kung was appointed Bishop of Soochow on June 9th. On July 15th he was transferred to Shanghai and appointed Apostolic Administrator of Soochow and Nanchino. During this time, he devoted himself to pastoral work, also contributing considerably to the spread of the Legion of Mary, outlawed as "a spy association" by the government. Sensing that freedom was being more and more restricted he sought to prepare many young men for the priesthood. He was arrested with about a hundred other priests and Catholic leaders on September 8, 1955, and five years later given a life sentence. He was released in July 1985, and held under house arrest until 1997. He was then sent to the United States officially "for medical care." 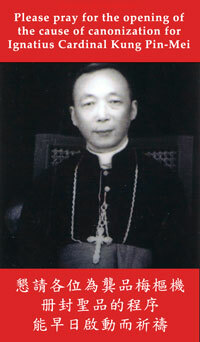 In 1991 Pope John Paul II revealed that he had created Bishop Kung a Cardinal "in pectore" during the 1979 Consistory. In 1997, when Chinese President Jiang Zemin made an official visit to the United States, Cardinal Kung sent Zemin a personal request for the release of Chinese Bishop Su Zhimin and other bishops and priests in prison. Last year, the Chinese Consulate in New York refused to renew his passport and withdrew his old one. 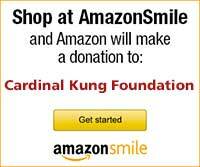 The Cardinal Kung Foundation (http://www.cardinalkungfoundation.org) works to inform the public about religious persecution in China. Cardinal Kung's stature is revealed by one incident in 1985, related by the "Fides" Agency. When he was released after 30 years of prison and was still under house-arrest, Cardinal Gong met Philippine Cardinal Jaime Sin, who traveled to China for the encounter. However the authorities only allowed the two Cardinals to meet during an official lunch together with members of the Chinese Catholic Patriotic Association and of the Communist Party. At table there were at least twenty people between the two men. At the end of the meal the Cardinal of Manila suggested that each of the guests should sing something, according to sound Karaoke tradition. When it was his turn, Cardinal Kung sang out the Latin acclamation: "You are Peter and upon this rock I will build my Church". Highly embarrassed, some of those present tried to interrupt, but he continued looking meaningfully at Cardinal Sin. So the Philippine Cardinal was able to leave with a message for the world, that thirty years of prison had not in the slightest way weakened the faith of Bishop of Shanghai or his loyalty to the Pope.